I had a few of you ask about the shirt that went along with my niece's birthday outfit. I did make embellish the shirt, but didn't sew it from scratch. Embellishing is my favorite approach to a top. First I started with a 24 month size onesie. They can be hard to come by, but I've picked some up at Ross Dress for Less, and this particular one my mom found for me. 1-Scrap piece of knit fabric, mine was a piece of dance knit that I use for super hero cape appliques. First off, you'll want to make a template. Start by placing your scrap piece of paper over top of the onesie. Feel your way around the neckline, tracing the basic shape. Follow the neckline all of the way up to the top, extending about an inch underneath the envelope closure. 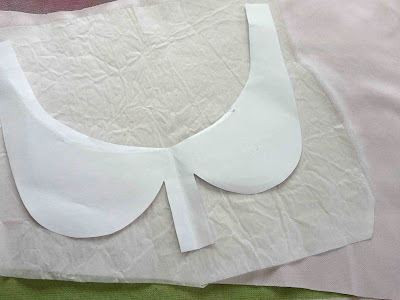 Once you have your basic neckline shape, fold the paper in half, at the center point of the neckline. Sketch out your basic peter pan collar on one side, add a mini placket if you'd like, and cut. With your template folded in half, it should be cut symmetrically. Once you have your template, transfer the shape to the paper side of your fusible web. 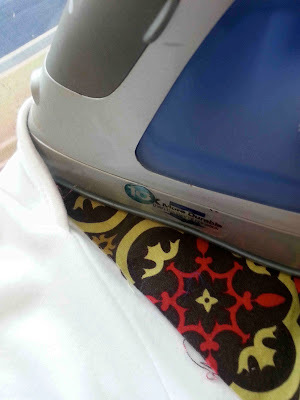 Iron your fusible web to the back side of your knit material. Once your fusible web has cooled, cut out your collar. 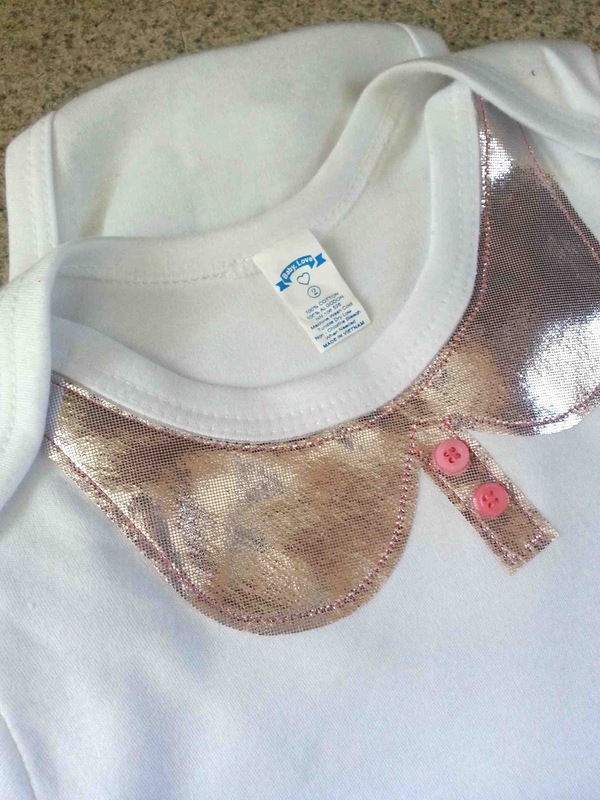 Position your collar on the outside of the onesie, matching up center marks (look for the tag). Use a press cloth to prevent any foiled knits from melting, and adhere to the onesie according to manufacturers directions. 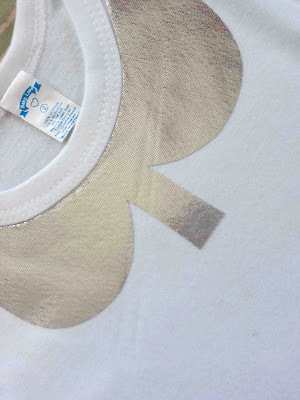 Make sure that you are adhere the collar under the envelope sleeve as well. Once adhered and cooled, stitch 1/8" away from the outside of the collar. If you are using knits, you should not have to worry about finishing off edges. A straight stitch with a ball point needle will do the trick. Add a couple of matching buttons to the faux placket, and you are done. 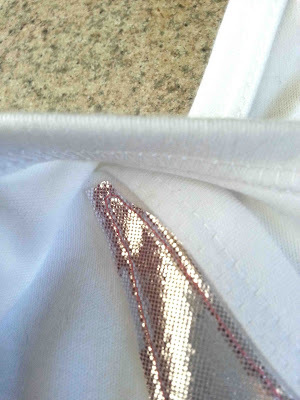 Here is a look at the tips of the collar that hides under the envelope sleeve. I like the collar to extend right up to the top of the shoulder, that way it doesn't peek out when the shirt is being worn. Obviously, you could use this technique with any shirt, it doesn't have to be a bodysuit. You could either extend the collar up to the shoulder seam, or create a narrow band to extend around the back of a crew neck top. There you have it. A super quick embellishment. It adds just a bit of sparkle, and is still wearable. Tricia, this is adorable! 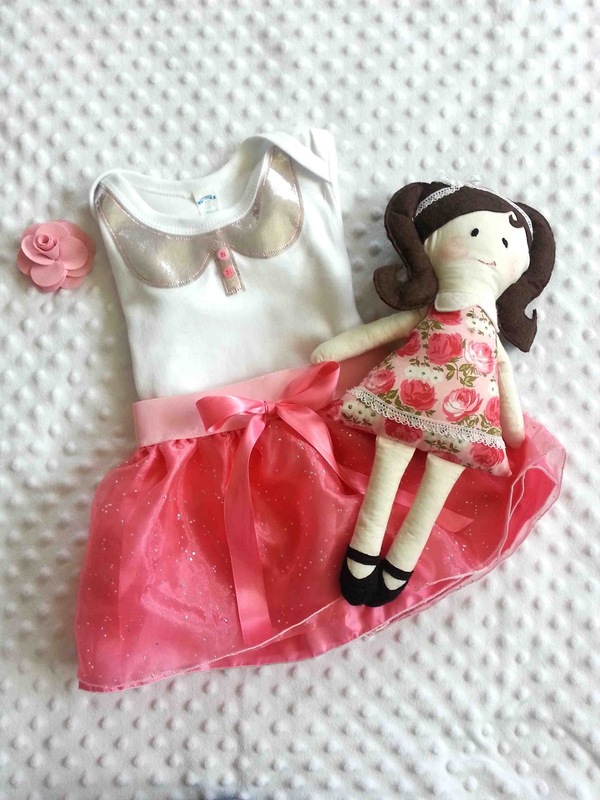 I'm just getting caught up so I'm heading to check out the skirt next :) Love the outfit!